The AE86 generation of the Toyota Corolla Levin and Toyota Sprinter Trueno is a small, lightweight coupe introduced by Toyota in 1983 as part of the fifth generation Toyota Corolla line-up. For the purpose of brevity, the insider-chassis code of “AE86” is used to describe the whole range. In classic Toyota code, the “A” represents the engine that came in the car (the 3A and 4A) and the E86 represents the 6th revision of the fifth generation (E80 series) of the E model which is the Corolla. The visual difference between the Levin and Trueno is that the former has fixed-headlights and the latter has retractable headlights. The export model name Corolla covers both variations. The AE86 (along with the lower spec 1452 cc AE85 and 1587 cc SR5 versions) was rear wheel drive (unlike the front wheel drive CE80, EE80 and AE82 models), and is among the last rear-drive cars of its type, at a time when most passenger cars were being switched to front-drive. The AE86 was replaced in 1987 by the front wheel drive AE92 Corolla/Sprinter range. The AE86 was also known as the Hachi-Roku (ハチロク, Hachi-Roku ) (after the numbers eight (ハチ, hachi ) and six (ロク, roku ) in Japanese). The AE86 was available with a fuel-injected 4-cylinder twin-cam 1587 cc 4A-GEU engine in Japan and Europe which was also used in the first-generation Toyota MR2 (AW11). This engine had a maximum power output of 130 PS (97 kW) and 103 ft·lbf (140 nm) of torque in standard form. The AE86 came with a 5-speed manual gearbox, and later came with the option of an automatic. The 4A-GE engines used in the AE86 and AW11 were equipped with T-VIS (Toyota Variable Induction System). The AE86 had an optional Limited Slip Differential (LSD). In North America, a modified 4A-GEC engine was used to comply with California emissions regulations. Power was rated at 112 bhp (84 kW), and 100 ft·lbf (136 nm) of torque. The AE86 used ventilated disc brakes. The car was equipped with a MacPherson strut style independent suspension at the front and a four-link live axle with coil springs for the rear. Stabilizer bars were present at both ends. Lower-spec American AE86 SR5 models used the 1587 cc 4A-C SOHC unit, did not have an optional LSD, and had rear drum brakes. Also, the SR5 model had a softer suspension, and small styling and interior changes. Models equipped with the 4A-GE engine received a 6.7″ rear differential, while 3A-U, 4A-U, and 4A-C models received a smaller, weaker, 6.38″ rear differential. The AE86 SR5 (4A-C equipped) had an optional automatic transmission, though the GT-S model (with the 4A-GE DOHC engine) only came with a standard 5-speed manual gearbox. One of the staff who was behind the car’s engineering work was Nobuaki Katayama, who would later head the company’s motorsport department and who would become chief engineer of the Altezza project a decade later. An article in Car Magazine in April 1999, stated he has a photo of an AE86 hung in his office. Both the Levin and Trueno variants were offered with either a 2-door coupe or 3-door liftback (sometimes called hatchback) body style. Both the Levin and Trueno were generally identical, apart from fixed, rectangular headlights on the Levin and pop-up headlights on the Trueno. Minor bodywork changes were made in 1986 which resulted in different tail lights for both Levin and Trueno models, along with the coupe and hatchback styles. The models sold between 1983–1985 are commonly referred to as “Zenki” in Japan, and the models sold from 1986–1987 are referred to as “Kouki”. The coupe version is considered to be more rigid and lighter version of the two. In Japan, the DOHC 4A-GEU AE86 was offered in GT-APEX and GTV trims as the Corolla Levin or Sprinter Trueno, with SOHC 3A-U AE85 version sold in a variety of trims including SR, GT, et cetera. 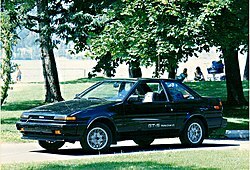 In America, the top-spec DOHC 4A-GEC was sold as the Corolla GT-S AE88, with the SOHC 4A-C AE86 bearing the Corolla SR5 tag. Both versions sold with pop-up headlights only. Euro spec models were sold as the Corolla GT with DOHC engines and fixed Levin-style headlights. The Middle East received the same basic model as the North American market, with pop-up headlights and the regulated 5 mph (8 km/h) bumpers. Due to a light weight of around 940 kg(2072 lb), and over 120 bhp (89 kW) power, the car could reach a top speed of 120 mph (193 km/h), and could accelerate from 0–60 mph in 8.5 seconds in standard specification. There are three types of Corolla Sport RWD for the US market: DX, SR5, and GT-S, though it seems the DX was more of an internal Toyota designation, as brochures, and the like do not include the DX designation; it was more of an interior trim level, as most everything else is the same as the SR5. It is grouped in with the SR5 in this list, as that is the commonly used name for all North American Corolla Sport models that are not GT-S equipped. During its production life, the AE86 was a popular choice for showroom stock, Group A, and Group N racing, especially in rallying and circuit races. Even after production of the car was discontinued, many privateer teams still raced the AE86, and it is still a popular choice for rallying and club races today. Part of the continued appeal of the AE86 for motorsports is its rear-drive configuration, a feature not available in most newer lightweight coupes. In Group A world rally cars (1600 cc class) the 4AGZE engine was popular. In Group A touring car races, the car either dominated the lower category where eligible or fought it out with Honda Civics or the later AE92s and AE101s whilst maintaining its competitiveness. In Ireland, where rallying is considered one of the most popular forms of motorsport, as organizing regulations are more relaxed compared to that of other countries, the AE86 was popular when new, and is still so popular that teams will purchase cars from the UK due to local shortages. The AE86 is also popular for rally use in Finland, where the cars can be competitive in the F-Cup competition for naturally aspirated 2WD cars. The semi-factory supported Kraft team entered a spaceframe Trueno at the JGTC with a 3S-GTE engine that came from a SW20 MR-2 Turbo producing about 300 hp as for the GT300 regulation in 1998. Despite being popular with the racefans, the car had minor success and was abandoned from use halfway through the 2001 season in favor of a newly delivered Toyota MR-S. The rear wheel drive configuration, combined with the AE86’s light weight (approximately 2300 lb (1043 kg) curb weight), balance and relatively powerful (and easy to tune) 4A-GEU|4A-GEC engine made it popular among the Japanese hashiriya (street racers in Japanese), many of whom raced in mountain passes (touge in Japanese) where the corners suited the AE86 best, especially on the downhill. Among those who utilized this car was Japanese racing legend Keiichi Tsuchiya, also known as the Dori-Kin (“Drift King” in Japanese). Tsuchiya helped popularize the sport of drifting, which involves taking a car on a set of controlled slides through corners. The AE86’s FR configuration made it well suited to this kind of cornering, and currently the car is a mainstay of drift shows and competitions. In fact most of the D1GP drivers who have competed have owned an AE86 and the last two D1GP’s have been won by drivers with naturally aspirated 16-Valve AE86’s; the older, lower-powered Corolla outperforming much newer, faster cars such as the Altezza and Skyline. The Hachi-Roku is prominently featured by manga artist Shuichi Shigeno in the manga/anime series Initial D. A panda paint-schemed Trueno with a tofu shop signage on its driver’s side door is driven by lead character Takumi Fujiwara. A turbocharged (later supercharged) Levin variant is driven by one of Takumi’s later rivals Wataru Akiyama. Takumi’s friend Itsuki Takeuchi unintentionally buys a lower trim Corolla, a Levin AE85, thinking it is an AE86. Some computer and video games have included the AE86, either as base model cars, or specially tuned cars, including all installments of Gran Turismo. This entry was posted in Automobil and tagged ae86, initial-D, trueno. Simply want to say your article is as astonishing. The clarity for your submit is simply excellent and i can think you are a professional on this subject. Fine with your permission allow me to take hold of your feed to keep updated with impending post. Thanks 1,000,000 and please carry on the enjoyable work.